I love this group Earth Day art project. Working together in order to build a sense of community among your students, have them create a mural that represents the earth's rain forest, desert, oceans, and north poles. 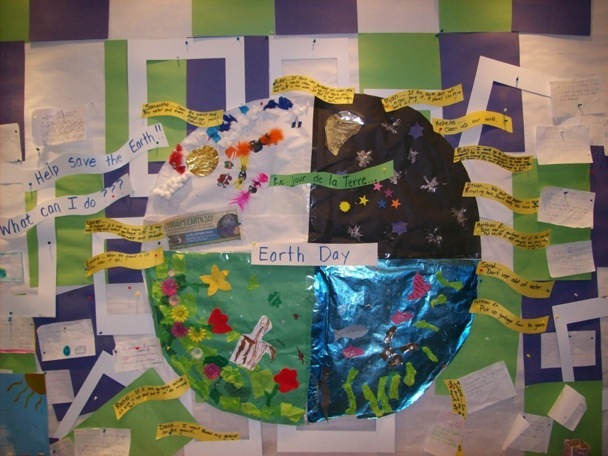 This idea came from the Earth Day lesson plans from Preschoolers 4 All. Check them out here. Cute project on Earth Day. I am officially on Spring Break, so am going to start thinking about some of those spring themes. Thanks for sharing this cute project! That's so cute! My kids love some art projects so they would be all about this! I'll have to check out preschoolers 4 all, thanks for sharing! Very cute! This is a great idea for Earth Day!! Love this project! Thanks for sharing. I am coming today from Can Do Kinders but I love the project you have posted today. I follow your blog normally and love the ideas. This is a really great project!!! Yah!! I am glad you got it!! I hope your kiddos love it! The Grouchy Ladybug.... Glitter Style!! The Jellybeans and the Big Book Bonanza Giveaway! Super Joyful about Joyful Learning in KC!! "Greatest Teacher" in Technology Giveaway!